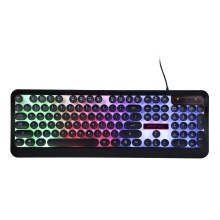 Therainbow LED backlit gaming keyboard stands up to gaming longevity, responsiveness, durability. Compatible with Windows XP / Windows 2000 / Vista / Mac. Comes with rainbow LED backlight. Provide you with crystal clear backlighting by custom mechanical switch. Featured with suspended keys with sensitive pressing and gives you perfect hand feeling. Designed with double-shot injection molded keycaps and offerring ABS scratching-off construction. Several drain holes at the bottom of the keyboard for draining out water. Splash-proof and water-proof design. Adopting ergonomic design. Fit for your hand feeling and provide you with comfortable experience.